Jumping Jets. A mind-blowing water effect that defies the laws of gravity and fluid physics. It is essentially a water rod, so steady that resembles to glass and yet so lively. This glass-like stream always follows its arc-shaped, parabolic trajectory without falling under it. Seeing this special water effect closely is an astonishing experience both day and night with its amazing million-color light spectrum. We precisely engineered and manufactured these jets to be absolutely stunning, in every manner. Construction-wise, they are entirely made of stainless steel, inside-out, to insure the integrity of the jet & the water effect and remain pristine under the harshest adversities for years to come even when operating overtime. Engineering-wise, we developed a remarkable low voltage Cutting Mechanism which is not based in motors or solenoids with incredible characteristics like droplet-free cutting and 10 bursts per second. 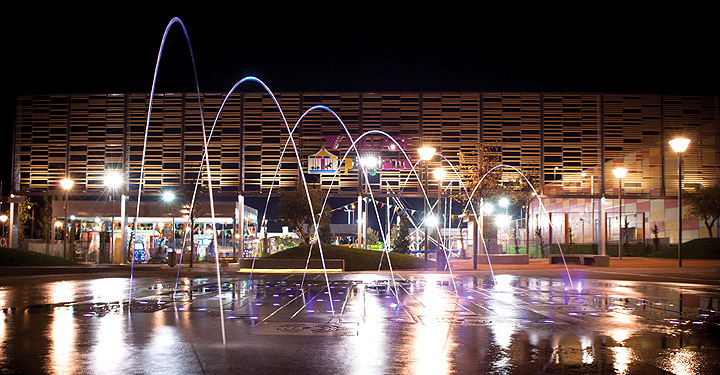 Illumination-wise, we incorporated an amazing 8W, RGBW, 4-core, single chip luminaire with exceptionally vivid colors to uniformly illuminate the water stream internally in its entire length. Electronics-wise, we made Jumping Jets capable to be controlled over a multitude of platforms – from simple electronic panels, to PLCs, to DMX, to BMS systems, even through iPad. Description: Creates a glass-like water stream, features an advanced low-voltage cutting mechanism for endless water effects with high speed bursts, a low-voltage 8W four-core, single chip RGBW luminaire with addressable module, 16-step thermal protection and reverse-polarity protection, housing entirely made of stainless steel with stainless steel nozzle and a heavy duty base with smart arrangement and laser-marked guides of installation angles.